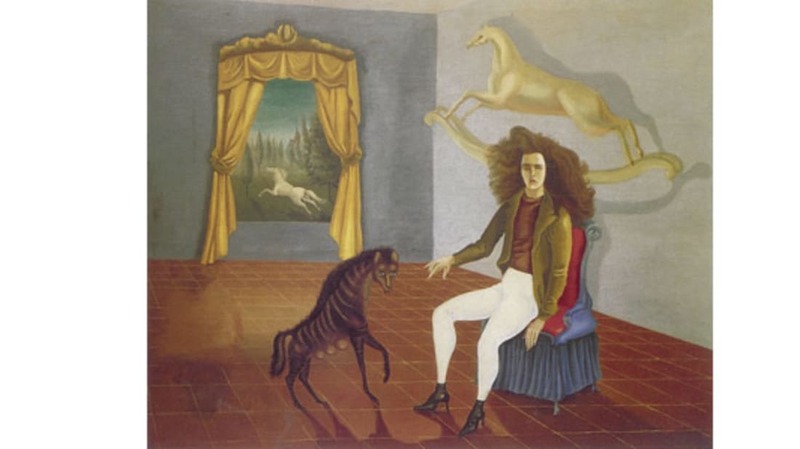 Leonora Carrington, requested by reader Brandon Z., is one of the last living original Surrealists. The English-Mexican artist was singled out by Salvador Dali as "the most important female artist," but today she's probably more well-known for her colorful life than her colorful paintings. 2. Carrington's interest in the surreal and supernatural was sparked at a young age. When she was 9 and attending the first of her convent schools, she decided she wanted to become a saint and be able to levitate. She attended her first Surrealism exhibition at age 10. Later in her life, she dabbled in alchemy and the occult, both of which are frequently referenced in her artwork. 3. In 1936, Carrington viewed Max Ernst's work at a London exhibit. Carrington fell in love with the artist, 20 years her senior, through his artwork; Carrington explains, "I fell in love with Max's paintings before I fell in love with Max. " Ernst left his wife for Carrington, his "Bride of the Wind," and the two ran away to Paris together. Their time together was short-lived, though: Ernst was taken by the Gestapo during the invasion of France in 1940. He later managed to escape to America with the help of Peggy Guggenheim. Carrington, devastated, fled to Spain and suffered a nervous breakdown, landing her in a psychiatric hospital. 5. When Carrington's parents attempted to send her to a South African sanatorium after the Spanish psychiatric hospital, Carrington slipped away from her handlers and ran to the Mexican embassy. She enlisted the help of her friend, Renato Leduc, a Mexican poet and diplomat. The two entered into a marriage of convenience so that Carrington could move to Mexico; the marriage was dissolved within two years. 7. Carrington's list of acquaintances reads like a Who's Who of the art world: Pablo Picasso, Salvador Dali, Andre Breton, Man Ray, Joan Miro, Frida Kahlo, Diego Rivera"¦ Her closest friend in the art world, though, was Remedios Varo. The two met in Mexico and became great friends; Carrington even stated that Varo's presence in Mexico would change her life. A larger version of Carrington's "Self-Portrait," shown above, is available here. Fans should check out the Carrington pages on Facebook and MySpace; Reauters' interview of Carrington; the 2008 exhibition of Carrington's sculpture in Mexico; Carrington's drawings in the Tate; and this video adaptation of one of Carrington's short stories. "Feel Art Again" usually appears three times a week. Looking for a particular artist? Visit our archive for a complete listing of all 250+ artists that have been featured. You can e-mail us at feelartagain@gmail.com with details of current exhibitions, for sources or further reading, or to suggest artists.